Grab your brood and come celebrate the 10th Anniversary of the Festival with keynote speakers Kenn Kaufman and Sharon Beals. Get your bird on with 50+ events in 3 days throughout Marin and Sonoma Counties. 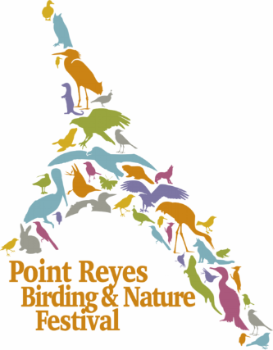 Visit the Point Reyes Birding & Nature Festival website for more information. Directions: Take Hwy 101 north to just past Healdsburg at the Hwy 128 exit in Alexander Valley. Follow Hwy 128 to just past Jimtown Store and turn left (straight) on to Pine Flat Road. Be careful of bicycles. Meet at the road shoulder on the right next to the vineyards just past Red Winery Road and before the bridge. We will carpool from there. We'll make a few stops before heading to the top then work our way back down. Lunch/snack at Pine Flat itself. There are no bathrooms. Bring lunch and water. This should be a fabulous adventure!! There are birds here that don't nest elsewhere in the state like Bobolink and Eastern Kingbird. We can also search for species tough to find elsewhere like Greater Sage Grouse (very rare), Yellow Rail, Juniper Titmouse, Cordilleran Flycatcher, Franklin's Gull, Black Tern, eastern spring migrants, and wild horses! This trip is still in planning stages. Recommended camping spot is Stough Reservoir Campground in the Warner Mountains about 13 miles from Alturas. This is a first-come/first-served campground (alternate would be Cedar Pass Campground which is closer to town), but Flammulated Owls and Long-eared Owls have been reported consistently from Stough. Camp fees are around $10-$14 per night. There are several motels in Alturas (but without personal experience). Looks like Hacienda Motel (530-233-3459) is newly renovated, seemed lower priced than some of the others, and is very close to Modoc NWR. It is very important to let me know if you are coming on this trip! Being so remote we may have cell phone difficulty. I am bringing the walkies. I will be leaving Thursday, May 30th and heading home Monday, June 3rd. Directions: Take Hwy 12 to Kenwood and turn up Adobe Canyon Road. Meet at the lower parking just after entrance. There is a parking fee ($8) but we can park cars for free just back on the road where there is a large pullout and carpool. We will first hike to the Waterfall in the redwoods which has trails and stairs steep for only a short bit. Then we'll head to the upper part of the park (where we meet for the annual picnic) and hike out the meadows along the creek. There is a bathroom at the upper parking area. Bring layers, water, lunch. No dogs allowed in this park. Join us as members of RROS share tales from their recent journey to Oaxaca, Mexico. The trip was not your usual tick-off-as-many-new-species-as-possible bird tour, but rather a collaboration with Mexican colleagues deeply involved in bird and habitat conservation south of our border. This multimedia presentation will feature a variety of exotic and endemic bird species and highlight their time spent with the Tierra de Aves, A.C.’s Bird Banding Program. RROS Monthly Meeting - March Program: Presentation by John Sterling, master county lister and noted field ornithologist. Join us for a presentation by John Sterling, master county lister and noted field ornithologist. John has worked with the Smithsonian Migratory Bird Center in Washington, DC, and various institutions in California and Latin America, focusing on the ecology and conservation of birds and regulatory processes related to preserving them. John will discuss the changes in our knowledge of bird distribution and population in the Central Valley since the publication of Grinnell and Miller’s book on California birds in the 1940s. Loss of habitats, creation of new habitats, reduction of ranges, invasions of new species and other topics will be explored as we reconcile the fact that more species are detected now than prior to the book’s publication. John currently has his own company, Sterling Wildlife Biology (www.sterlingbirds.com), specializing in tours, birding classes, research and environmental consulting for The Nature Conservancy, National Audubon’s International Alliance Program, CA Dept. of Water Resources among other organizations. Meet at 7:00 pm at intersection of Fitzpatrick Lane and Salmon Creek Road in Bodega, California. Please carpool and wear quiet clothes (no nylon shells, parachute material). Owls that may be heard in area: Barn, Great Horned, Western Screech, Northern Pygmy-Owl, Northern Saw-whet, and Spotted. There will be no calling/tapes for Spotteds. Please note: This is the night before Daylight Saving Time starts. Birders should be at the Hudeman Slough gated bridge at 9:15 am. We will enter and exit via the North Gate at the end of Skaggs Island Rd. Skaggs Island Rd is off Ramal Rd, about 3.6 miles east of Hwy 12. Parts of the road are rough. There is something new on this road, a gate at the north side of the bridge over Hudeman Slough. I will be there to let cars pass on to the north gate. Once inside, we will circle the island. On the island until about 12:30. Skaggs Island is part of the San Pablo Bay NWR. The island is a former naval base grown up in grassland and coyote brush. Diurnal raptors are the primary attraction. Among the dozens of harriers, kites and red-tails we will look for Prairie Falcon, Rough-legged Hawk, Golden Eagle and Burrowing Owl. Ferruginous Hawk and Short-eared Owl are possible. Marsh, brush and eucalyptus at the abandoned housing site hosts local wintering songbirds, the newly arrived Allen’s Hummingbird, and Merlin. Black Rail is sometimes heard from the tidal slough. We will loop the island in our vehicles. There will be a short walk along the Second Napa Slough levee. After Skaggs, we may check Hudeman Slough. In addition to raptors, Hudeman hosts waterfowl and wading birds. *Please note, in the event of a second government shutdown the Skaggs field trip will be cancelled. Monthly Meeting: Coldest, Driest, Windiest: Studying Adélie penguins at the bottom of the earth. Join us as Point Blue Antarctica Project Leader Annie Schmidt discusses topics related to Adélie Penguin Ecology. The discussion will include an introduction to the Adélie penguin, an introduction to the Ross Sea and its global importance, how Adélie penguins are studied and what has been found in their recent work, conservation application, and recent observations from this winter’s (Antarctica’s summer) trip. We can get coffee, snacks, bathroom there and we will move cars for car pooling. We will bird along the way in Lake County then at Colusa NWR, Bring lunch, water, layers, a scope would be helpful.There are bathrooms at the Refuge. Heavy rain cancels. Join us for an informative talk by esteemed Naturalist and RROS member Lisa Hug as she goes through some challenges of using the hundreds of hotspots around Bodega Bay and surrounding coastal areas. She will also examine frequent identification issues encountered in our region. First United Methodist Church, 1551 Montgomery Dr., Santa Rosa. The Santa Rosa CBC, for 2018, will be held on Sunday, December 16th. The compilation dinner will be held at Adel’s Cafe, on Mendocino Ave, Sunday evening at 5:00 o’clock. The meeting's theme is “Members Share”, an appropriate focus for this season of giving! It’s not too late to organize some of your work to share. In past years we’ve been treated to members’ photo slide presentations of birds from both near and far as well as member artists’ renditions of backyard and field observations from here and there. Bring whatever you’ve enjoyed from your own collection so that we can enjoy hearing and sharing both audio and visual experiences with you. Remember to put your photos on a flash drive! Redwood Region Ornithological Society is a non-profit 501(c). All are welcome.